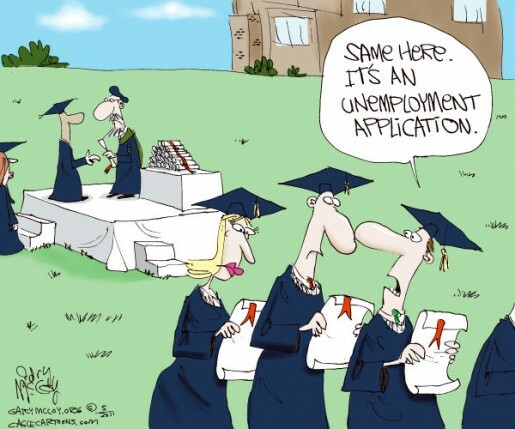 I’ve been inundated with the idea of ‘Generation Screwed’ lately and, even though I am float in that limbonic state between ‘Generation X & Y,’ I feel more in tune with the problems facing graduates today. I too was taught that if I got a good education that I could ‘be’ whatever I wanted to – that I could follow my dream. Then, in my graduating year my class is told that 90% of us will be hired full-time in our field of study within 1 year. Who ever thinks that they will fall into the 10% who don’t make it? Because I followed my dream, I majored in an over-saturated market and struggled for full-time employment for 11 years. Okay, so was it my dream to be a teacher? At one point I thought it was. I had always been told, “You can’t make a living writing” so I focused on my passion for reading and the written word in a different context. I started thinking that I could use my summers to write and become the stereotypical teacher/writer – but that didn’t work either. I constantly sought to upgrade my qualifications in order to find that elusive full-time employment and had little time for my writing, my dream. Realistically, my husband and I married young (because we wanted to, not because we had to) and our work has translated into a necessity to survive. Now, I’m not comparing myself to a poor 3rd-world child who has no sense of Maslow’s Hierarchy of Needs because survival truly is the only thing he can focus on. No. I live in a 1st-world country, born into a lower-middle class financial bracket, and I am talking about the realities of a perceived life on those terms. Like today’s generation, I feel as though I have been lied to. My education has allowed me to maintain my socioeconomic tax bracket that I was promised I could ‘rise above.’ But the world doesn’t work that way. My husband hates his job (for which he did study for in university) but it was never his dream. I have grown to hate the politics behind the new reality of teaching, and I am still sitting in the red trying to follow my dream of writing. But is it perhaps that I have already achieve my dream? When you tear away the ‘Disney’ veil of expectations, lose your optimism for skepticism (or even pessimism in my husband’s case) are we then able to see the reality of what it is to dream? I am still living in my socioeconomic tax bracket, putting good food on my table with a newly patched roof overhead, tutoring on the side while I raise my child, run an editing business, write freelance and wait to announce that the latest contract deal for my book series will actually be accepted. So, what more then, could I want? I guess the answer to that is ease of life – for that really is the universal dream right? To not have to worry, beg, scratch, or claw out a reality for your dreams but to simple be able to enjoy them. How possible is that?